If you aren’t completely certain what’s going on in your boyfriend’s heart, you need to start paying closer attention to give you some clarity regarding why he does what he does. If he pulls away from you, he’s not necessarily indicating that he wants to end the relationship. You may need some patience as he works through some things. He may be completely in love, but if he’s got past experiences that are preventing him from being vulnerable, or things going on inside his head, you may be treading in the proverbial “gray area.” He may be showing you signs he loves you, but he’s afraid to fully give in to it. This may not be a totally bad thing. It will help if you’re aware of what’s going on, so you can help him figure out the next steps towards the ultimate goal of commitment. So how can you figure out if he loves you, but at the same time is afraid to commit to you? Here are some tips that can help you work things out. Things are either hot or cold. When you’re together, there’s passion, sparks and heat. You’re connected with each other, you can have deep conversations, and you can laugh together. But if you’re apart, you’re really apart. He doesn’t return your calls or answer your texts. He won’t commit to planning things. This is quite common. Guys who aren’t ready to commit often act quite differently when they’re with you from when you’re apart. Maybe he’s been single for a while, and is content to remain so. Maybe he thought he’d always be a bachelor. But then you came along, and everything changed. In his head, he may still believe he doesn’t want to be in a committed relationship. But his heart may not agree. This leaves him in a dilemma. The longer he’s with you, the more persuasive his heart becomes. Which only makes his brain fight back harder. In other words, he’s confused. As a result, the signs he’s giving you are confusing. Many men believe that vulnerability is a bad thing, that shows their weakness. But in fact, the opposite is true. Being emotionally vulnerable can help him become more intimate with you, and lay the foundation for the healthiest type of relationship. So when he’s apart from you, he may have an easier time than when he’s with you in putting emotional distance between the two of you. So is he confused? Or is he really not interested in you? How can you figure it out? In the gentlest way you can, point out the contrasts in his actions between when you are with him and when you’re apart. Tell him when you’re apart you miss feeling connected. Don’t put pressure on him, but be clear that you value your relationship with him. He expends energy in many aspects in his life, but not in your relationship. A guy who is ready to commit will want to spend a significant amount of time together with you. He will invest a significant amount of his energy in your relationship to help it grow in a positive direction. But maybe he told you he can’t make a date with you because he’s hanging out with his friends. Or he canceled your date because he needs to wash his car. Maybe you recommended a book to him about relationships and commitments, but he watched the big game last night instead. Now his car is sparkling and his team won, but your relationship feel like it’s been left behind in the dust. So why does he say “I love you” if he’s scared to commit? Often, men make bucket lists of the goals they want to accomplish before they commit in a relationship. Maybe he wants to become financially stable, and is focused on earning a promotion at work. Maybe he wants to keep sowing those proverbial wild oats. Or follow the dream of becoming a professional gamer. 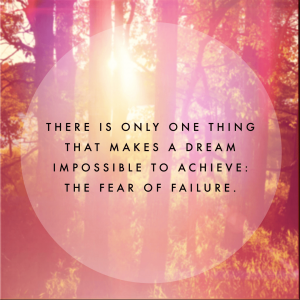 Regardless of his goal, he feels you’re standing in the way of his dreams, no matter how silly those dreams may seem. He has to become mature enough before he realizes that it’s time to settle down. Then his attitudes about commitment will change, and he’ll be willing to fully invest in the relationship. It’s not always possible to plan out our lives that way. But egos are fragile, and if a guy’s sense of balance is upset, he’ll naturally pull back until he realizes that life may be taking him in a different direction from what he planned. Notice the signs he’s sending you, and try to be patient. Things will work out. He wants to commit, then he doesn’t. It doesn’t make sense. He said he’d meet your parents, and you’ve hung out with each other’s friends. You’ve even begun keeping things at each other’s apartments. But when you bring up future plans, he shuts you out. This means he’s going to have to work through some things. 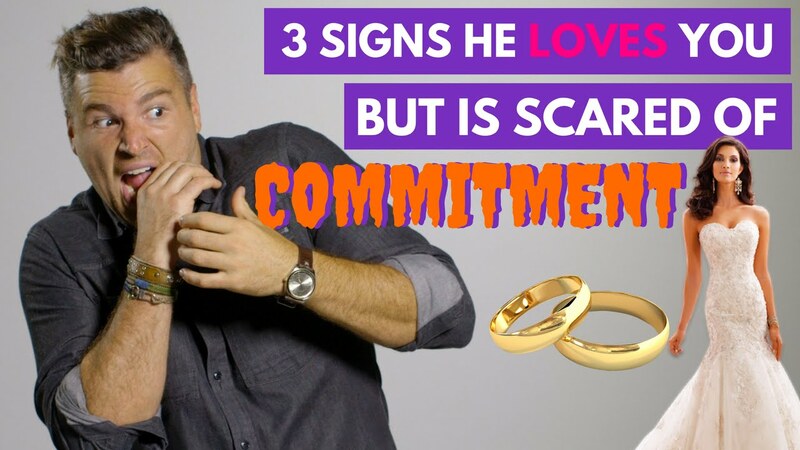 You see signs that he’s in love with you, but he’s clearly not ready to commit. You need to come up with a strategy to deal with this situation and to help him out. First, you need to realize that his aversion to discussing the long-term future doesn’t mean that he isn’t in love with you. The aversion actually is a sign that he does love you, but fears what the future may bring. His fear may stem from past relationship experiences, or possibly from his parents’ relationship, especially if they’re divorced. Don’t give him an ultimatum, and don’t try to force him to commit. When he pulls away, your instinct may be to grab on and pull him closer. But the best way to handle the situation is to give him the time and space he needs to work through the concept of committing with you. So don’t rush him, and don’t try to control him. You know he loves you. He’ll commit to you when he’s ready to. Try to occasionally bring it up in conversation, though. Ask why he’s so against talking about the future. This can only help him as he works through the fears. The more you talk about it, the better you’ll understand his feelings and why he has them. Two people with their own distinct personalities can find it difficult to synchronize their wants, their needs and their maturity level. Don’t blame each other for being in different places emotionally or mentally. 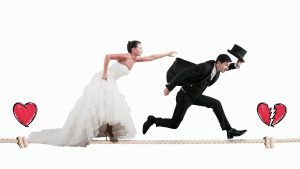 Try to discern if he’ll overcome his fears about commitment, and it’s worth it to wait for him. While it’s often necessary to compromise in relationships, you can’t be the one doing all the compromising. If he continues insisting that he’ll never get married, and you’re always working to change his mind, your relationship may not ever work out. You deserve to be happy. It may take some time, but the right guy will commit.